When air escapes a home it goes up, not out. This makes your home’s attic the first place to start when making home energy upgrades. 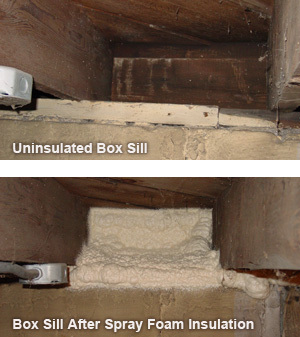 Upgrading your attic insulation adds a thermal layer that will help maintain your home’s inside temperature. You can go one step further by sealing air leaks in your attic. According to ENERGY STAR, 60% of a home’s air leaks exist in the attic. Insulating and air sealing your attic will help make your home more comfortable and save money on energy bills year after year. Box sills are the area of the basement where the outside wall of the home meets the joist of the first floor. Box sills are constructed with a thin layer of siding, plywood and foam board. 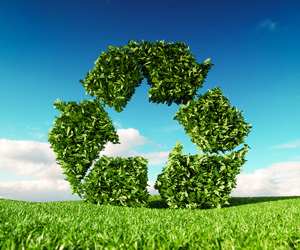 These materials are not enough to prevent energy loss, cold basements and high energy bills. In fact, some estimates indicate that 25% of a home’s heat loss is a result of uninsulated box sills. We recommend adding spray foam insulation to box sills to both insulate and air seal this critical area. A friendly reminder: Schedules fill up quickly during fall and winter. Be patient when scheduling with a qualified insulation contractor. 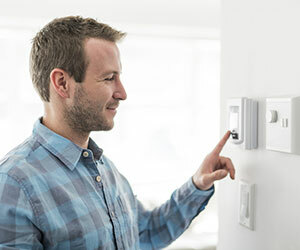 It’s worth waiting for an insulation expert to review your home and recommend proper energy upgrades. 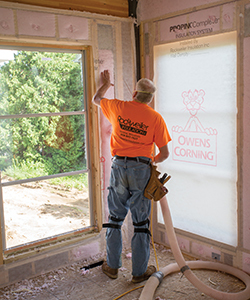 Have questions about adding insulation to your home? Contact our office. Our team is happy to help! It’s common for homeowners to tackle home upgrades and DIY projects. If you’re thinking of installing your own insulation, think again! Properly insulating a structure is more than throwing insulation into a wall. Our estimators regularly receive calls asking us to fix improperly installed insulation. 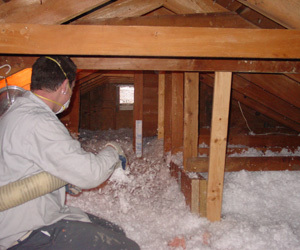 Quality insulation involves sealing air leaks and properly installing fiberglass insulation. Air sealing is as important in wall cavities as it is in attics and throughout a home. Improper or incomplete air sealing (behind electrical boxes, sealing wire penetrations, etc.) leads to drafty walls and comfort issues. After air sealing, it’s important to install fiberglass insulation. Fiberglass insulation must be properly installed to achieve maximum R-value. This includes installing fiberglass batt insulation to completely fill a cavity – from top to bottom, and from side to side. Well trained installers know the best methods for installing fiberglass batt insulation to achieve maximum R-value. As easy as it may sound, attempting to tackle your home’s insulation on your own can create a list of headaches. Once a wall or other cavity is closed with drywall, outside air can infiltrate the cavity and become trapped inside. This can result in discoloration, frost on your wall, mildew and possibly even mold. Proper installation and air sealing help maintain the integrity of your entire home. Don’t let the perceived cost savings of DIY insulation end up costing you more in the long run. Hire a professional insulation contractor and have the job done right the first time! Call our office to schedule your free estimate.